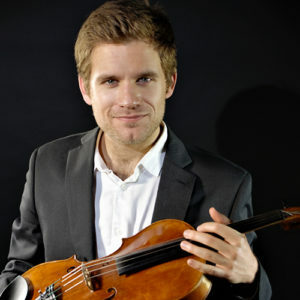 Born in Lisbon in 1991, Ricardo Gaspar began playing the viola at age eight at Fundação Musical dos Amigos das Crianças in Portugal. He completed his bachelor’s degree at the Escola Superior de Música de Lisboa studying with Pedro Muñoz, and his Master of Arts at the Royal Academy of Music in London, where he was awarded the DipRAM for his recital. As an orchestral musician, he has been a member of the European Union Youth Orchestra, a guest principal violist with the Geneva Chamber Orchestra, and has collaborated with the London Symphony Orchestra. In 2012, Mr. Gaspar won the Portuguese Young Musicians Award and was selected “Young Musician of the Year,” performing as soloist with the Gulbenkian Orchestra, Lisbon Metropolitan Orchestra, and the RTÉ National Symphony Orchestra in Ireland. Most recently, he participated in the 70th anniversary concert of Trevor Pinnock at Wigmore Hall, performed in the 42nd International Viola Congress held in Oporto, and was awarded a special prize at the 12th Lionel Tertis International Viola Competition. Mr. Gaspar currently attends the International Menuhin Music Academy in Switzerland and studies with Ivan Vukcevic and Maxim Vengerov.